"Capital of Taiwan" redirects here. For the capital of streamlined Taiwan Province, see Zhongxing New Village. "Capital of the Republic of China" redirects here. For historical capitals of the Republic of China, see Nanjing and Chongqing. For the capital of the People's Republic of China, see Beijing. This article is about the capital city. For other uses, see Taipei (disambiguation). Etymology: pinyin: Táiběi; literally: "Taiwan north"
Taipei (/ˌtaɪˈpeɪ/), officially known as Taipei City, is the capital[lower-alpha 1] and a special municipality of Taiwan (officially known as the Republic of China, "ROC"). Sitting at the northern tip of the island, Taipei City is an enclave of the municipality of New Taipei City. It is about 25 km (16 mi) southwest of the northern port city Keelung. Most of the city is located on the Taipei Basin, an ancient lakebed bounded by the two relatively narrow valleys of the Keelung and Xindian rivers, which join to form the Tamsui River along the city's western border. Formerly known as Taipeh-fu during the Qing era and Taihoku under Japanese rule, Taipei became the capital of Taiwan Province when Taiwan was transferred to the Republic of China by Japan in 1945 and has been the capital[lower-alpha 2] of the ROC since 1949, when the Kuomintang lost the mainland to the Communist Party of China in the Chinese Civil War. The city proper is home to an estimated population of 2,704,810 (2015), forming the core part of the Taipei–Keelung metropolitan area which includes the nearby cities of New Taipei and Keelung with a population of 7,047,559, the 40th most-populous urban area in the world—roughly one-third of Taiwanese citizens live in the metro district. The name "Taipei" can refer either to the whole metropolitan area or the city proper. Taipei is the political, economic, educational, and cultural center of Taiwan island, and one of the major hubs of East Asia. Considered to be a global city, Taipei is part of a major high-tech industrial area. Railways, high-speed rail, highways, airports, and bus lines connect Taipei with all parts of the island. The city is served by two airports – Taipei Songshan and Taiwan Taoyuan. Taipei is home to various world-famous architectural or cultural landmarks which include Taipei 101, Chiang Kai-shek Memorial Hall, Dalongdong Baoan Temple, Hsing Tian Kong, Lungshan Temple of Manka, National Palace Museum, Presidential Office Building, Taipei Guest House, Ximending, and several night markets dispersing over the city. Its natural features such as Maokong, Yangmingshan, and hot springs are also well known to international visitors. As the capital city, "Taipei" is sometimes used as a synecdoche for the Republic of China. Due to the ongoing controversy over the political status of Taiwan, the name Chinese Taipei is designated for official use when Taiwanese governmental representatives or national teams participate in some international organizations or international sporting events such as the Olympics. The spelling Taipei derives from the Wade–Giles romanization T'ai-pei. The name could be also romanized as Táiběi according to Hanyu Pinyin and Tongyong Pinyin. Prior to the significant influx of Han Chinese immigrants, the region of Taipei Basin was mainly inhabited by the Ketagalan plains aborigines. The number of Han immigrants gradually increased in the early 18th century under Qing Dynasty rule after the government began permitting development in the area. In 1875, the northern part of the island was incorporated into the new Taipeh Prefecture. The Qing dynasty of China made Taipeh the temporary capital of the island in 1887 when it was declared a province (Fukien-Taiwan Province). Taipeh was formally made the provincial capital in 1894. Japan acquired Taiwan in 1895 under the Treaty of Shimonoseki after the First Sino-Japanese War. Taiwan became a colony of Imperial Japan with Taihoku (formerly Taipeh) as its capital, in which the city was administered under Taihoku Prefecture. Taiwan's Japanese rulers embarked on an extensive program of advanced urban planning that featured extensive railroad links. A number of Taipei landmarks and cultural institutions date from this period. Following the Japanese surrender of 1945, control of Taiwan was handed to the Republic of China (ROC) (see Retrocession Day). After losing mainland China to the Chinese Communist Party in the Chinese Civil War, the ruling Kuomintang relocated the ROC government to Taiwan and declared Taipei the provisional capital of the ROC in December 1949. In 1990 Taipei provided the backdrop for the Wild Lily student rallies that moved Taiwanese society from one-party rule to multi-party democracy. The city is today home to Taiwan's democratically elected national government. The region known as the Taipei Basin was home to Ketagalan tribes before the eighteenth century. Han Chinese mainly from Fujian Province of Qing dynasty China began to settle in the Taipei Basin in 1709. In the late 19th century, the Taipei area, where the major Han Chinese settlements in northern Taiwan and one of the designated overseas trade ports, Tamsui, were located, gained economic importance due to the booming overseas trade, especially that of tea export. In 1875, the northern part of Taiwan was separated from Taiwan Prefecture and incorporated into the new Taipeh Prefecture as a new administrative entity of the Qing dynasty. Having been established adjoining the flourishing townships of Bangka, Dalongdong, and Twatutia, the new prefectural capital was known as Chengnei (Chinese: 城內; pinyin: chéngnèi; Pe̍h-ōe-jī: siâⁿ-lāi), "the inner city", and government buildings were erected there. From 1875 until the beginning of Japanese rule in 1895, Taipei was part of Tamsui County of Taipeh Prefecture and the prefectural capital. In 1885, work commenced to govern the island as a province, and Taipeh was temporarily made the provincial capital. The city officially became the capital in 1894. All that remains from the Qing era is the north gate. The west gate and city walls were demolished by the Japanese while the south gate, little south gate, and east gate were extensively modified by the Kuomintang and have lost much of their original character. As settlement for losing the First Sino-Japanese War, China ceded the island of Taiwan to the Empire of Japan in 1895 as part of the Treaty of Shimonoseki. After the Japanese take-over, Taipei, called Taihoku in Japanese, was retained as the capital and emerged as the political center of the Japanese Colonial Government. During that time the city acquired the characteristics of an administrative center, including many new public buildings and housing for civil servants. Much of the architecture of Taipei dates from the period of Japanese rule, including the Presidential Building which was the Office of the Governor-General of Taiwan. During Japanese rule, Taihoku was incorporated in 1920 as part of Taihoku Prefecture. It included Bangka, Twatutia, and Jōnai (城內) among other small settlements. The eastern village of Matsuyama (松山庄, modern-day Songshan District, Taipei) was annexed into Taihoku City in 1938. Upon the Japanese defeat in the Pacific War and its consequent surrender in August 1945, the Kuomintang (Chinese Nationalist Party) assumed control of Taiwan. Subsequently, a temporary Office of the Taiwan Province Administrative Governor was established in Taipei City. In 1947 the Kuomintang (KMT) government under Chiang Kai-shek declared island-wide martial law in Taiwan as a result of the February 28 Incident, which began with incidents in Taipei but led to an island-wide crackdown on the local population by forces loyal to Chiang. Two years later, on 7 December 1949, Chiang and the Kuomintang forces were forced to flee mainland China by the Communists near the end of the Chinese Civil War. The KMT-led national government that fled to Taiwan declared Taipei to be the provisional capital of a continuing Republic of China, with the official capital at Nanjing (Nanking) even though that city was under Communist control. Taipei expanded greatly in the decades after 1949, and as approved on 30 December 1966, by the Executive Yuan, Taipei was declared a special centrally administered municipality on 1 July 1967, and given the administrative status of a province. In the following year, Taipei City expanded again by annexing Shilin, Beitou, Neihu, Nangang, Jingmei, and Muzha. At that time, the city's total area increased fourfold by absorbing several outlying towns and villages and the population increased to 1.56 million people. The city's population, which had reached one million in the early 1960s, also expanded rapidly after 1967, exceeding two million by the mid-1970s. Although growth within the city itself gradually slowed thereafter — its population had become relatively stable by the mid-1990s — Taipei remained one of the world's most densely populated urban areas, and the population continued to increase in the region surrounding the city, notably along the corridor between Taipei and Keelung. In 1990 Taipei's 16 districts were consolidated into the current 12 districts. Mass democracy rallies that year in the plaza around Chiang Kai-shek Memorial Hall led to an island-wide transition to multi-party democracy, where legislators are chosen via regularly scheduled popular elections, during the presidency of Lee Teng-Hui. Taipei City is located in the Taipei Basin in northern Taiwan. It is bordered by the Xindian River on the south and the Tamsui River on the west. The generally low-lying terrain of the central areas on the western side of the municipality slopes upward to the south and east and especially to the north, where it reaches 1,120 metres (3,675 ft) at Qixing Mountain, the highest (inactive) volcano in Taiwan in Yangmingshan National Park. The northern districts of Shilin and Beitou extend north of the Keelung River and are bordered by Yangmingshan National Park. The Taipei city limits cover an area of 271.7997 km2 (104.9425 sq mi), ranking sixteenth of twenty-five among all counties and cities in Taiwan. Two peaks, Qixing Mountain and Mt. Datun, rise to the northeast of the city. Qixing Mountain is located on the Tatun Volcano Group and the tallest mountain at the rim of the Taipei Basin, with its main peak at 1,120 metres (3,670 ft). Mt. Datun's main peak is 1,092 metres (3,583 ft). These former volcanoes make up the western section of Yangmingshan National Park, extending from Mt. Datun northward to Mt. Caigongkeng (菜公坑山). Located on a broad saddle between two mountains, the area also contains the marshy Datun Pond. To the southeast of the city lie the Songshan Hills and the Qingshui Ravine, which form a barrier of lush woods. Taipei has a monsoon-influenced humid subtropical climate (Köppen: Cfa). Summers are long-lasting, hot and humid, and accompanied by occasional heavy rainstorms and typhoons, while winters are short, generally warm and generally very foggy due to the northeasterly winds from the vast Siberian High being intensified by the pooling of this cooler air in the Taipei Basin. As in the rest of Northern Taiwan, daytime temperatures of Taipei can often peak above 26 degrees Celsius during a warm winter day, while they can dip below 26 degrees Celsius during a rainy summer's afternoon. Occasional cold fronts during the winter months can drop the daily temperature by 3 to 5 degrees Celsius, though temperatures rarely drop below 10 degrees Celsius. Extreme temperatures ranged from −0.2 °C (31.6 °F) on 13 February 1901 to 39.3 °C (102.7 °F) on 8 August 2013, while snow has never been recorded in the city besides on mountains located within the city limit such as Yangmingshan. Due to Taiwan's location in the Pacific Ocean, it is affected by the Pacific typhoon season, which occurs between June and October. When compared to other Asian cities, Taipei has "excellent" capabilities for managing air quality in the city. Its rainy climate, location near the coast, and strong environmental regulations have prevented air pollution from becoming a substantial health issue, at least compared to cities in southeast Asia and industrial China. However, smog is extremely common and there is poor visibility throughout the city after rain-less days. Motor vehicle engine exhaust, particularly from motor scooters, is a source of air pollution in Taipei. There are higher levels of fine particulate matter and polycyclic aromatic hydrocarbons in the mornings because of less air movement; sunlight reduces some pollution. Occasionally, dust storms from Mainland China can temporarily bring extremely poor air quality to the city. Taipei viewed from Tiger Mountain, with Taipei 101 on the left. Source: "Populations by city and country in Taiwan". Ministry of the Interior Population Census. Taipei City is home to 2,704,810 people (2015), while the metropolitan area has a population of 7,047,559 people. The population of the city has been decreasing in recent years while the population of the adjacent New Taipei has been increasing. The population loss, while rapid in its early years, has been stabilized by new lower density development and campaigns designed to increase birthrate in the city. The population has begun to rise since 2010. Due to Taipei's geography and location in the Taipei Basin as well as differing times of economic development of its districts, Taipei's population is not evenly distributed. The districts of Daan, Songshan, and Datong are the most densely populated. These districts, along with adjacent communities such as Yonghe and Zhonghe contain some of the most densely populated neighborhoods in the world. In 2008, the crude birth rate stood at 7.88% while the mortality rate stood at 5.94%. A decreasing and rapidly aging population is an important issue for the city. By the end of 2009, one in ten people in Taipei was over 65 years of age. Residents who had obtained a college education or higher accounted for 43.48% of the population, and the literacy rate stood at 99.18%. Like the rest of Taiwan, Taipei is composed of four major ethnic groups: Hoklos, Mainlanders, Hakkas, and aborigines. Although Hoklos and Mainlanders form the majority of the population of the city, in recent decades many Hakkas have moved into the city. The aboriginal population in the city stands at 12,862 (<0.5%), concentrated mostly in the suburban districts. Foreigners (mainly from Indonesia, Vietnam, and the Philippines) numbered 52,426 at the end of 2008. As Taiwan's business, financial, and technology hub, Taipei has been at the center of rapid economic development in the country and has now become one of the global cities in technology and electronics. This is part of the so-called Taiwan Miracle which has seen dramatic growth in the city following foreign direct investment in the 1960s. Taiwan is now a creditor economy, holding one of the world's largest foreign exchange reserves of over US$403 billion as of December 2012. Despite the Asian financial crisis, the economy continues to expand at about 5% per year, with virtually full employment and low inflation. The city's GDP stand at US$327 billion in 2014. As of 2013, the nominal GDP per capita in Taipei city is 5th highest in East Asia, behind Tokyo, Singapore, Osaka, and Hong Kong, but ahead of Seoul, as well as London and Paris, according to The Economist. GDP per capita based on Purchasing Power Parity (PPP) in Taipei in 2015 was US$44173, behind that of Singapore (US$90151 in 2016 from the IMF) and Hong Kong (US$58322 in 2016 from the IMF; also based on PPP). The Financial Times ranked Taipei highly in economic potential (2nd, behind Tokyo) and business friendliness (4th) in 2015. The city is home to 30 billionaires, the 16th most in the world, ahead of many global cities such as Los Angeles and Sydney. Business Insider also ranks Taipei the 5th most high-tech city globally, the highest in Asia, in 2017. While the IESE Cities in Motion Index 2017 ranks Taipei as the smartest technology city globally. Taipei's main development fields include the information and communications technology (hardware and software), biotechnology, general merchandising (wholesale/retail), financial services, and MICE industries. Most of the country's major firms are based there including Asus, CTBC Bank, Fubon Financial Holding, Tatung Company, D-Link, and others. 5 Global Fortune 500 companies are headquartered in Taipei. The city also attracts many multi-national corporations, international financial institutions, foreign consulates, and business organizations to set up base there. Thus, Taipei has nearly 3,500 registered foreign businesses and attracts over 50% of the total foreign investment in Taiwan. Foreign companies with offices or regional headquarters in Taipei include Google, Microsoft, IBM, Intel, HSBC, Citibank, Facebook, Amazon, Apple, JP Morgan, PwC, and many others. Most financial and foreign firms like to reside in the central business district of Taipei, the Xinyi Special District. With Citi, JP Morgan, DBS Bank, Cathay Life Insurance, Shin Kong Commercial Bank, Hua Nan Bank, and soon Fubon Financial and Nan Shan Life Insurance all establishing skyscrapers in the area. Meanwhile technology and electronics companies are often colocated in the Neihu Technology Park or the Nankang Software Park. The startup and innovation scene in Taipei is also very vibrant. In 2018 alone, Microsoft announced plans to invest US$34 million to create an artificial intelligence R&D center in Taipei, while Google announced it will hire 300 people and train 5,000 more in artificial intelligence for machines. Taipei is currently Google's biggest engineering site in Asia. IBM also announced in 2018 that it will develop a cloud research lab and expand its R&D center in Taipei with eyes on artificial intelligence, blockchain technology, and cloud computing. According to the 2016 Global Entrepreneurship Development Index, Taipei's entrepreneurial spirit ranks 6th worldwide and 1st in Asia. Taipei has more than 400 startups and numerous incubation centers, accelerators, venture capitals, and angel investors. The city's startup ecosystem is valued at US$580 million by Startup Genome in 2018. Tourism is a small but significant component of the local economy with international visitors totaling almost 3 million in 2008. Taipei has many top tourist attractions and contributes a significant amount to the US$6.8 billion tourism industry in Taiwan. Tourism is a major part of Taipei's economy. In 2013, over 6.3 million overseas visitors visited Taipei, making the city the 15th most visited globally. The influx of visitors contributed $10.8 billion USD to the city's economy in 2013, the 9th highest in the world and the most of any city in the Chinese-speaking world. The National Chiang Kai-shek Memorial Hall is a famous monument, landmark and tourist attraction that was erected in memory of General Chiang Kai-shek, former President of the Republic of China. The structure stands at the east end of Memorial Hall Square, site of the National Concert Hall and National Theater and their adjacent parks as well as the memorial. The landmarks of Liberty Square stand within sight of Taiwan's Presidential Building in Taipei's Zhongzheng District. The National Taiwan Museum sits nearby in what is now 228 Peace Memorial Park and has worn its present name since 1999. The museum is Taiwan's oldest, founded on 24 October 1908 by Taiwan's Japanese colonial government (1895-1945) as the Taiwan Governor's Museum. It was launched with a collection of 10,000 items to celebrate the opening of the island's North-South Railway. In 1915 a new museum building opened its doors in what is now 228 Peace Memorial Park. This structure and the adjacent governor's office (now Presidential Office Building), served as the two most recognizable public buildings in Taiwan during its period of Japanese rule. The National Palace Museum is a vast art gallery and museum built around a permanent collection centered on ancient Chinese artifacts. It should not be confused with the Palace Museum in Beijing (which it is named after); both institutions trace their origins to the same institution. The collections were divided in the 1940s as a result of the Chinese Civil War. The National Palace Museum in Taipei now boasts a truly international collection while housing one of the world's largest collections of artifacts from ancient China. The Shung Ye Museum of Formosan Aborigines stands just 200 metres across the road from the National Palace Museum. The museum offers displays of art and historical items by Taiwanese aborigines along with a range of multimedia displays. The Taipei Fine Arts Museum was established in 1983 as the first museum in Taiwan dedicated to modern art. The museum is housed in a building designed for the purpose that takes inspiration from Japanese designs. Most art in the collection is by Taiwanese artists since 1940. Over 3,000 art works are organized into 13 groups. The National Sun Yat-sen Memorial Hall near Taipei 101 in Xinyi District is named in honor of a founding father of the Republic of China, Sun Yat-sen. The hall, completed on 16 May 1972, originally featured exhibits that depicted revolutionary events in China at the end of the Qing Dynasty. Today it functions as multi-purpose social, educational, concert and cultural center for Taiwan's citizens. In 2001 a new museum opened as Museum of Contemporary Art Taipei. The museum is housed in a building that formerly housed Taipei City government offices. Taipei 101 is a 101-floor landmark skyscraper that claimed the title of world's tallest building when it opened in 2004, a title it held for six years before relinquishing it to the Burj Khalifa in Dubai. Designed by C.Y. Lee & Partners and constructed by KTRT Joint Venture, Taipei 101 measures 509 m (1,670 ft) from ground to top, making it the first skyscraper in the world to break the half-kilometer mark in height. Built to withstand typhoon winds and earthquake tremors, its design incorporates many engineering innovations and has won numerous international awards. Taipei 101 remains one of the tallest skyscrapers in the world and holds LEED's certification as the world's largest "green" building. Its shopping mall and its indoor and outdoor observatories draw visitors from all over the world. Taipei 101's New Year's Eve fireworks display is a regular feature of international broadcasts. The National Theater and Concert Hall stand at Taipei's Liberty Square and host events by foreign and domestic performers. Other leading concert venues include Zhongshan Hall at Ximending and the Sun Yat-sen Memorial Hall near Taipei 101. A new venue, the Taipei Performing Arts Center, is under construction and slated to open in 2015. The venue will stand near the Shilin Night Market and will house three theaters for events with multi-week runs. The architectural design, by Rem Koolhaas and OMA, was determined in 2009 in an international competition. The same design process is also in place for a new Taipei Center for Popular Music and Taipei City Museum. Taipei is known for its many night markets, the most famous of which is the Shilin Night Market in the Shilin District. The surrounding streets by Shilin Night Market are extremely crowded during the evening, usually opening late afternoon and operating well past midnight. Most night markets feature individual stalls selling a mixture of food, clothing, and consumer goods. Ximending has been a famous area for shopping and entertainment since the 1930s. Historic structures include a concert hall, a historic cinema, and the Red House Theater. Modern structures house karaoke businesses, art film cinemas, wide-release movie cinemas, electronic stores, and a wide variety of restaurants and fashion clothing stores. The pedestrian area is especially popular with teens and has been called the "Harajuku" of Taipei. The newly developed Xinyi District is popular with tourists and locals alike for its many entertainment and shopping venues, as well as being the home of Taipei 101, a prime tourist attraction. Malls in the area include the sprawling Shin Kong Mitsukoshi complex, Breeze Center, Bellavita, Taipei 101 mall, Eslite Bookstore's flagship store (which includes a boutique mall), The Living Mall, ATT shopping mall, and the Vieshow Cinemas (formerly known as Warner Village). The Xinyi district also serves as the center of Taipei's active nightlife, with several popular lounge bars and nightclubs concentrated in a relatively small area around the Neo19, ATT 4 FUN and Taipei 101 buildings. Lounge bars such as Barcode and nightclubs such as Spark and Myst are among the most-visited places here. The thriving shopping area around Taipei Main Station includes the Taipei Underground Market and the original Shin Kong Mitsukoshi department store at Shin Kong Life Tower. Other popular shopping destinations include the Zhongshan Metro Mall, Dihua Street, the Guang Hua Digital Plaza, and the Core Pacific City. The Miramar Entertainment Park is known for its large Ferris wheel and IMAX theater. Taipei maintains an extensive system of parks, green spaces, and nature preserves. Parks and forestry areas of note in and around the city include Yangmingshan National Park, Taipei Zoo and Da-an Forest Park. Yangmingshan National Park (located 10 kilometres (6.2 mi) north of the central city) is famous for its cherry blossoms, hot springs, and sulfur deposits. It is the home of famous writer Lin Yutang, the summer residence of Chiang Kai-shek, residences of foreign diplomats, the Chinese Culture University, the meeting place of the now defunct National Assembly of the Republic of China, and the Kuomintang Party Archives. The Taipei Zoo was founded in 1914 and covers an area of 165 hectares for animal sanctuary. Bitan is known for boating and water sports. Tamsui is a popular sea-side resort town. Ocean beaches are accessible in several directions from Taipei. Taipei has a variety of temples housing Buddhist, Taoist, and Chinese folk religion deities. The Mengjia Longshan Temple, built in 1738 and located in the Wanhua District, demonstrates an example of architecture with southern Chinese influences commonly seen on older buildings in Taiwan. Xinsheng South Road is known as the "Road to Heaven" due to its high concentration of temples, shrines, churches, and mosques. Other famous temples include Baoan Temple located in historic Dalongdong, a national historical site, and Xiahai City God Temple, located in the old Dadaocheng community, constructed with architecture similar to temples in southern Fujian. The Taipei Confucius Temple traces its history back to 1879 during the Qing Dynasty and also incorporates southern Fujian-style architecture. Besides large temples, small outdoor shrines to local deities are very common and can be seen on road sides, parks, and neighborhoods. Many homes and businesses may also set up small shrines of candles, figurines, and offerings. Some restaurants, for example, may set up a small shrine to the Kitchen God for success in a restaurant business. Many yearly festivals are held in Taipei. In recent years some festivals, such as the Double Ten Day fireworks and concerts, are increasingly hosted on a rotating basis by a number of cities around Taiwan. When New Year's Eve arrives on the solar calendar, thousands of people converge on Taipei's Xinyi District for parades, outdoor concerts by popular artists, street shows, round-the clock nightlife. The high point is the countdown to midnight, when Taipei 101 assumes the role of the world's largest fireworks platform. The Taipei Lantern Festival concludes the Lunar New Year holiday. The timing of the city's lantern exhibit coincides with the national festival in Pingxi, when thousands of fire lanterns are released into the sky. The city's lantern exhibit rotates among different downtown locales from year to year, including Liberty Square, Taipei 101, and Zhongshan Hall in Ximending. On Double Ten Day, patriotic celebrations are held in front of the Presidential Building. Other annual festivals include Ancestors Day (Tomb-Sweeping Day), the Dragon Boat Festival, the Ghost Festival, and the Mid-Autumn Festival (Moon Festival). Taipei regularly hosts its share of international events. The city recently hosted the 2009 Summer Deaflympics. This event was followed by the Taipei International Flora Exposition, a garden festival hosted from November 2010 to April 2011. The Floral Expo was the first of its kind to take place in Taiwan and only the seventh hosted in Asia; the expo admitted 110,000 visitors on 27 February 2011. Note: The list below is not a complete list, they are examples of more notable movies filmed in the city. Taipei City is a special municipality which is directly under the Executive Yuan (Central Government) of ROC. The mayor of Taipei City had been an appointed position since Taipei's conversion to a centrally administered municipality in 1967 until the first public election was held in 1994. The position has a four-year term and is elected by direct popular vote. The first elected mayor was Chen Shui-bian of the Democratic Progressive Party. Ma Ying-jeou took office in 1998 for two terms, before handing it over to Hau Lung-pin who won the 2006 mayoral election on 9 December 2006. Both Chen Shui-bian and Ma Ying-Jeou went on to become President of the Republic of China. The incumbent mayor, Ko Wen-je, was elected on 29 November 2014 and took office on 25 December 2014. Based on the outcomes of previous elections in the past decade, the vote of the overall constituency of Taipei City shows a slight inclination towards the pro-KMT camp (the Pan-Blue Coalition); however, the pro-DPP camp (the Pan-Green Coalition) also has considerable support. Ketagalan Boulevard, where the Presidential Office Building and other government structures are situated, is often the site of mass gatherings such as inauguration and national holiday parades, receptions for visiting dignitaries, political demonstrations, and public festivals. Taipei City is also famous for its effort in garbage recycling, which has become such a good international precedent that other countries have sent teams to study the recycling system. After the Environmental Protection Administration (EPA) established a program in 1998 combining the efforts of communities, a financial resource named the Recycling Fund was made available to recycling companies and waste collectors. The EPA also introduced garbage recycling trucks, in effort to raise community recycling awareness, that broadcast classical music to announce its arrival to the community. Manufacturers, vendors and importers of recyclable waste pay fees to the Fund, which uses the money to set firm prices for recyclables and subsidize local recycling efforts. Between 1998 and 2008, the recycling rate increased from 6 percent to 32 percent. This improvement enabled the government of Taipei to demonstrate its recycling system to the world at the Shanghai World Expo 2010. Taipei City is divided up into 12 administrative districts (區 qu). Each district is further divided up into urban villages (里), which are further sub-divided up into neighborhoods (鄰). The city is characterized by straight roads and public buildings of grand Western architectural styles. The city is built on a square grid configuration, however these blocks are huge by international standards with 500 m (1,640.42 ft) sides. The area in between these blocks are infilled with lanes and alleys, which provide access to quieter residential or mixed-use development. Other than a citywide 30 kilometres per hour (19 mph) speed limit, there is little uniform planning within this "hidden" area; therefore lanes (perpendicular to streets) and alleys (parallel with street, or conceptually, perpendicular to the lane) spill out from the main throughways. These minor roads are not always perpendicular and sometimes cut through the block diagonally. Although development began in the western districts (still considered the cultural heart of the city) of the city due to trade, the eastern districts of the city have become the focus of recent development projects. Many of the western districts, already in decline, have become targets of new urban renewal initiatives. Public transport accounts for a substantial portion of different modes of transport in Taiwan, with Taipei residents having the highest utilization rate at 34.1%. Private transport consists of motor scooters, private cars, taxi cabs, and bicycles. Motor-scooters often weave between cars and occasionally through oncoming traffic. Respect for traffic laws, once scant, has improved with deployment of traffic cameras and increasing numbers of police roadblocks checking riders for alcohol consumption and other offenses. Taipei Station serves as the comprehensive hub for the subway, bus, conventional rail, and high-speed rail. A contactless smartcard, known as EasyCard, can be used for all modes of public transit as well as several retail outlets. It contains credits that are deducted each time a ride is taken. The EasyCard is read via proximity sensory panels on buses and in MRT stations, and it does not need to be removed from one's wallet or purse. Taipei's public transport system, the Taipei Metro (commonly referred to as the MRT), incorporates a metro and light rail system based on advanced VAL and Bombardier technology. There are currently five metro lines that are labelled in three ways: color, line number and depot station name. In addition to the rapid transit system itself, the Taipei Metro also includes several public facilities such as the Maokong Gondola, underground shopping malls, parks, and public squares. Modifications to existing railway lines to integrate them into the metro system are underway. In 2017 a rapid transit line was opened to connect Taipei with Taiwan Taoyuan International Airport and Taoyuan City. The new line is part of the new Taoyuan Metro system. Beginning in 1983, surface rail lines in the city were moved underground as part of the Taipei Railway Underground Project. The Taiwan High Speed Rail system opened in 2007. The bullet trains connect Taipei with the west coast cities of New Taipei, Taoyuan, Hsinchu, Taichung, Chiayi, and Tainan before terminating at Zuoying (Kaohsiung) at speeds that cut travel times by 60% or more from what they normally are on a bus or conventional train. The Taiwan Railway Administration also runs passenger and freight services throughout the entire island. An extensive city bus system serves metropolitan areas not covered by the metro, with exclusive bus lanes to facilitate transportation. Riders of the city metro system are able to use the EasyCard for discounted fares on buses, and vice versa. A unique feature of the Taipei bus system is the joint venture of private transportation companies that operate the system’s routes while sharing the fare system. This is in sharp contrast to bus systems in the U.S. which are mostly public entities. Several major intercity bus terminals are located throughout the city, including the Taipei Bus Station and Taipei City Hall Bus Station. Most scheduled international flights are served by Taoyuan International Airport in nearby Taoyuan City. Taipei Songshan Airport, at the heart of the city in the Songshan District, serves domestic flights and scheduled flights to Haneda Airport in Tokyo, Gimpo International Airport in Seoul, and about 15 destinations in the People's Republic of China. Songshan Airport is accessible by the Taipei Metro Neihu Line; Taoyuan International Airport is accessible by the Taoyuan Airport MRT. In 1994, with the rapid development of Taipei, a white paper for transport policies expressed the strong objective to "create a civilised transport system for the people of Taipei." In 1999, they chose Mitac consortium, which Thales-Transportation Systems is part of. Thales was then selected again in 2005 to deploy an upgrade of Taipei's public transport network with an end-to-end and fully contactless automatic fare collection solution that integrates 116 metro stations, 5,000 buses and 92 car parks. National Taiwan University (NTU) was established in 1928 during the period of Japanese colonial rule. NTU has produced many political and social leaders in Taiwan. Both pan-blue and pan-green movements in Taiwan are rooted on the NTU campus. The university has six campuses in the greater Taipei region (including New Taipei) and two additional campuses in Nantou County. The university governs farms, forests, and hospitals for educational and research purposes. The main campus is in Taipei's Da-An district, where most department buildings and all the administrative buildings are located. The College of Law and the College of Medicine are located near the Presidential Building. The National Taiwan University Hospital is a leading international center of medical research. National Taiwan Normal University (NTNU or Shida) likewise traces its origins to the Japanese colonial period. Originally a teacher training institution, NTNU has developed into a comprehensive international university with demanding entrance requirements. The university boasts especially strong programs in the humanities and international education. Worldwide it is perhaps best known as home of the Mandarin Training Center, a program that offers Mandarin language training each year to over a thousand students from dozens of countries throughout the world. The main campus in Taipei's Da-An district, near MRT Guting Station, is known for its historic architecture and giving its name to the Shida Night Market, one of the most popular among the numerous night markets in Taipei. Due to Taiwan being under American and Japanese influence over the years, the sports of baseball in particular and basketball have become popular in the city. Taipei, like the rest of the country, has featured most prominently in baseball and has often been the venue for the Asian Baseball Championship since the 1960s. The best doubles (tennis) player in the world Chan Yung-Jan is from Taipei too. The Taipei Arena is located at the site of the former Taipei Municipal Baseball Stadium (demolished in 2000), with a capacity of over 15,000. Designed by Archasia, the arena was opened on 1 December 2005. Since its opening in 2005, the arena has held more art and cultural activities (such as live concerts) than sporting events, which it was originally designed and built for. The main arena has an adjustable floor space: its minimum floor space is 60 m × 30 m (196.85 ft × 98.43 ft), and can be extended to 80 m × 40 m (262.47 ft × 131.23 ft). The Chinese Taipei Ice Hockey League (CIHL) plays out of the auxiliary arena, which is a 60 m × 30 m (196.85 ft × 98.43 ft) ice skating rink. The Tianmu Baseball Stadium is the major baseball venue in Taipei. Taipei has the only football-specific stadium in Taiwan, Zhongshan Soccer Stadium, which hosts the national football team. It hosts qualifiers for the FIFA World and AFC regional cups, and finals of school football tournaments. Since there are no professional football leagues in Taiwan, no other sporting events are held there, since 2009, the Taipei Stadium hosts the Soccer and Athletic events. In 2010, a Taipei baseball team—Chung-Ching Junior Little League—won the Junior League World Series, after winning the Asia-Pacific Region, then defeating the Mexico Region and Latin America Region champions to become the International champion, and finally defeating the U.S. champion (Southwest Region), Rose Capital East LL (Tyler, Texas), 9–1. . Its Little League World Series international team has won 17 championships, the most wins in the league. As the capital, Taipei City is the headquarters for many television and radio stations in Taiwan and the center of some of the country's largest newspapers. Television stations located in Taipei include the CTS Education and Culture, CTS Recreation, CTV MyLife, CTV News Channel, China Television, Chinese Television System, Chung T'ien Television, Dimo TV, Eastern Television, Era Television, FTV News, Follow Me TV, Formosa TV, Gala Television, Public Television Service, SET Metro, SET News, SET Taiwan, Sanlih E-Television, Shuang Xing, TTV Family, TTV Finance, TTV World, TVBS, TVBS-G, TVBS-NEWS, Taiwan Broadcasting System, Videoland Television Network and Taiwan Television. Newspapers include Apple Daily, Central Daily News, The China Post, China Times, DigiTimes, Kinmen Daily News, Liberty Times, Mandarin Daily News, Matsu Daily, Min Sheng Bao, Sharp Daily, Taipei Times, Taiwan Daily, Taiwan News, Taiwan Times and United Daily News. Taipei is a member of the Asian Network of Major Cities 21. ↑ Although the ROC claimed the whole sovereignty of all of China until 1991, Chiang Kai-Shek stated that Taipei became the temporary capital of the Republic of China on 7 December 1949 following the loss of Chengtu, the last city on the mainland and remains so to this day. ↑ 《中華民國統計資訊網》縣市重要統計指標查詢系統網 (in Chinese). Retrieved 13 June 2016. ↑ "Demographia World Urban Areas PDF" (PDF). Demographia. April 2016. Retrieved 2016-06-06. ↑ 土地人口概況 (PDF) (in Chinese). Retrieved 11 June 2016. ↑ "Demographia World Urban Areas PDF (April 2016)" (PDF). Demographia. Retrieved 2016-06-06. ↑ "Taipei". Random House Webster's Unabridged Dictionary. 1 2 "Taipei City Government: Home – I. Geographic Overview". Taipei City Government. 2006-10-23. Archived from the original on 9 December 2013. Retrieved 2009-08-04. 1 2 3 4 鄉鎮市區人口及按都會區統計. Taiwan Ministry of Interior. December 2015. Archived from the original on 2013-12-09. Retrieved 2016-12-11. ↑ "Methods and Term Definitions". Directorate General of Budget, Accounting and Statistics. Retrieved 2009-08-04. ↑ "The World According to GaWC 2008". Retrieved 2010-01-25. ↑ "Taiwan tech industry faces up to South Korea's Samsung". The Seattle Times. April 2013. Retrieved 2017-08-25. ↑ Skinner, G. William (1973). Modern Chinese society:an analytical bibliography. Stanford University Press. p. 55. ISBN 0-8047-0753-7. ↑ "Hanyu Pinyin to be standard system in 2009". Taipei Times. 2008-09-18. Retrieved 2008-09-20. ↑ "Gov't to improve English-friendly environment". The China Post. 2008-09-18. Archived from the original on 2008-09-19. Retrieved 2008-09-20. ↑ "Taipei's History and Development". Taipei City Government. November 2014. Retrieved 2015-01-15. ↑ "Taipei (Taiwan) :: History – Britannica Online Encyclopedia". Britannica.com. Retrieved 2010-07-04. ↑ Davidson, James W. (1903). The Island of Formosa, Past and Present : history, people, resources, and commercial prospects : tea, camphor, sugar, gold, coal, sulphur, economical plants, and other productions. London and New York: Macmillan & co. p. 245. OL 6931635M. 1 2 3 Marsh, Robert (1996). The Great Transformation. M. E. Sharpe. p. 84. ISBN 1-56324-788-7. 1 2 Ng, Franklin (1998). The Taiwanese Americans. Greenwood Publishing Group. p. 10. ISBN 0-313-29762-2. 1 2 "Taiwan Timeline – Retreat to Taiwan". BBC News. 2000. Retrieved 2009-07-13. Taipei has never been declared the official capital but Kuomintang loyalists today generally regard it as such. In 2004 elementary textbook references stating "Nanjing is the capital of the Republic of China" were replaced with "Taipei is the location of the central government of the Republic of China." ↑ "History". Taipei City Government. 2004-03-29. Archived from the original on 7 May 2005. Retrieved 2009-08-11. ↑ Kelly, Robert (2007). Taiwan. Lonely Planet Publications. p. 46. ISBN 1-74104-548-7. 1 2 3 "History of Taipei". Taipei City Government. Archived from the original on 26 May 2007. Retrieved 2009-08-11. ↑ Allen, Joseph R. (2012). Taipei: City of Displacements. Seattle: University of Washington Press. pp. 75–81. ISBN 978-0-295-80426-2. 1 2 Marsh (1996), p. 85. ↑ Republic of China Yearbook. Kwang Hwa Publishing Co. 2002. p. 120. ISBN 957-9227-35-7. ↑ "About Taipei – Taipei Profile". Department of Information and Tourism, Taipei City Government. Retrieved 2016-12-12. ↑ "Geographical Overview". english.gov.taipei. Retrieved 2016-12-12. 1 2 "Geography/Population". Taipei City Government. 2004-03-29. Archived from the original on 27 January 2005. Retrieved 2009-08-11. ↑ "Köppen−Geiger Climate Classification". Archived from the original on 2010-09-06. ↑ "Weather History for Sungshan, Taiwan". Wunderground. Retrieved 29 June 2014. ↑ "Climate". Central Weather Bureau. ↑ "Pollution is a major threat for Asian cities, says new report". EarthTimes. 2006-12-14. Retrieved 2010-07-22. ↑ Oung, Angelica (2007-05-04). "Taipei air pollution alarming: scientists". The Taipei Times. Retrieved 2009-07-27. ↑ "Poor air quality forecast due to Chinese sandstorm". The China Post. 2008-03-01. Retrieved 2010-07-22. 1 2 3 4 5 6 "Demographical Overview". Taipei City Government. Retrieved 2010-07-11. ↑ "Premier agrees to suspend sales of state-owned prime city land". Central News Agency. 2010-03-02. Retrieved 2010-07-11. ↑ "Taiwan's elderly population reaches one in 10: interior ministry". Central News Agency. 2010-01-23. Retrieved 2010-07-11. ↑ Kwok, R. Yin-Wang (2005). Globalizing Taipei: the political economy of spatial development. Routledge. p. 163. ISBN 0-415-35451-X. ↑ "National Statistics, Republic of China – Latest Indicators". Directorate General of Budget, Accounting and Statistics. Retrieved 2010-03-15. ↑ Parilla, Alan Berube, Jesus Leal Trujillo, Tao Ran, and Joseph (2015-01-22). "Global Metro Monitor". Brookings. Retrieved 2018-07-18. ↑ admin@hurun.net. "Hurun Report - Details". www.hurun.net. Retrieved 2018-07-18. ↑ "The 25 most high-tech cities in the world". Business Insider. Retrieved 2018-07-18. ↑ "IESE Cities in Motion Index 2017 | Cities in Motion". blog.iese.edu. Retrieved 2018-07-18. ↑ "Fortune Global 500 List 2017: See Who Made It". Fortune. Retrieved 2018-07-18. ↑ "ITO Invest Taipei". invest.taipei. Retrieved 2018-07-18. ↑ Jennings, Ralph. "Why Google, IBM & Microsoft Are All Expanding In Taiwan This Year". Forbes. Retrieved 2018-07-18. ↑ "Google expands in Taiwan, its top Asian R&D hub". Nikkei Asian Review. Retrieved 2018-07-18. ↑ "Taiwan Startups". AngelList. Retrieved 2018-07-18. ↑ 歷年觀光外匯收入統計. Tourism Bureau, Ministry of Transportation and Communication. Retrieved 2010-01-24. ↑ 97年臺閩地區主要觀光遊憩區遊客人次月別統計. Tourism Bureau, Ministry of Transportation and Communication. Retrieved 2010-01-24. ↑ "Euromonitor International's Top City Destination Ranking". 2010-01-20. Retrieved 2010-01-26. ↑ "Taiwan's tourism revenue on the rise: survey". Focus Taiwan News Channel. 2010-07-14. Retrieved 2010-07-15. 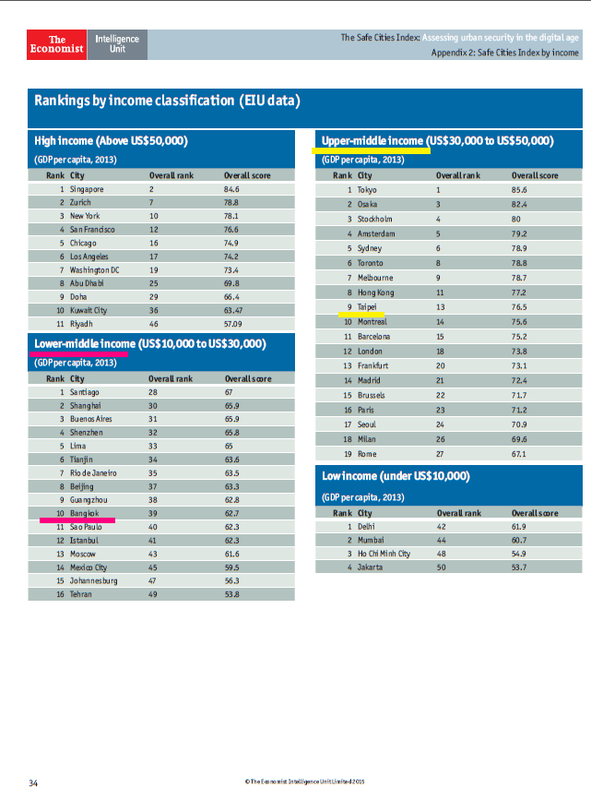 ↑ "2014 Global Destination Cities Index" (PDF). MasterCard. Retrieved 2014-07-10. ↑ "Taipei makes list of world's top 15 tourist destinations: survey". Focus Taiwan News Channel. 2014-07-09. Retrieved 2014-07-10. ↑ "National Chiang Kai-shek Memorial Hall". 2009-05-05. Retrieved 2009-08-09. 1 2 "National Taiwan Museum: History". National Taiwan Museum. Archived from the original on 22 April 2008. Retrieved 2009-08-09. ↑ "Taipei's National Palace Museum". BBC. Archived from the original on 2012-11-12. Retrieved 2008-06-04. 1 2 Nystedt, Dan (2007-06-03). "Ancient China's treasures go digital". Washington Post. Retrieved 2009-08-09. ↑ "The History of memorial hall". National Dr. Sun Yat-sen Memorial Hall. Retrieved 2016-12-16. ↑ "From History to Contemporary". Museum of Contemporary Art Taipei. Archived from the original on 2009-02-23. Retrieved 2009-08-09. ↑ Basulto, David (12 February 2012). "OMA's Taipei Performing Arts Center breaks ground". ArchDaily. Retrieved 9 August 2012. ↑ Reid, Robert (June 2011). "Taipei Performing Arts Center will feature seismic isolators and projecting auditoriums". Civil Engineering: 14–16. ↑ "Taipei Performing Arts Center promises to become world-class architecture". Taiwan News. 2009-11-08. Retrieved 2010-07-22. ↑ "Winning designs for Taipei Performing Arts Center on display". Central News Agency. 2009-03-21. Retrieved 2010-07-22. ↑ "Taipei invites architects | Taipei Times, 2008.07.25". Taipeitimes.com. 2008-07-25. Retrieved 2010-07-04. ↑ Kelly (2007), p. 99. ↑ Iwabuchi, Kōichi (2004). Feeling Asian modernities: transnational consumption of Japanese TV dramas. Hong Kong University Press. p. 111. ISBN 962-209-632-8. ↑ "Transformation of "Liugong Canal" – Looking Back on Xinsheng South Road". Department of Rapid Transit Systems. 2008-10-01. Archived from the original on 2011-09-12. Retrieved 2010-07-22. ↑ "About Daan District". Taipei City Government. Retrieved 2010-07-22. ↑ "Longshan Temple, Baoan Temple, and Xiahai City God Temple: Taipei's Glorious Heritage-Site Temples". Department of Information Technology. 2009-01-29. Archived from the original on 2011-06-29. Retrieved 2010-07-22. ↑ "Taipei Confucius Temple". Datong District Office, Taipei City. 2010-05-26. Archived from the original on 2011-08-15. Retrieved 2010-07-22. ↑ "About Taipei 5: Religions – Wikimania 2007, The International Wikimedia Conference". Wikimania2007.wikimedia.org. 2007-07-26. Retrieved 2009-07-27. 1 2 "Chapter 19 Tourism". Republic of China Yearbook 2008. ROC Government Information Office. Archived from the original on 2009-11-05. Retrieved 2009-07-14. ↑ "Your Favorite Ebook Site -". english.2009deaflympics.org. Archived from the original on 4 June 2013. Retrieved 26 July 2017. ↑ Kwok, R. Yin-Wang (2005). Globalizing Taipei. Routledge. p. 201. ISBN 0-415-35451-X. ↑ Bradsher, Keith (2006-12-10). "Taiwan Leader's Party Wins in Mayoral Vote, but Recount Is Sought". The New York Times. Retrieved 2009-07-14. ↑ Loa, Iok-sin; Ting, Wei-chieh; Chung, Jake (2014-12-26). "New mayors, commissioners sworn in". Taipei Times. Retrieved 2016-12-19. ↑ "Elections 2006: Election results a headache for Ma". Taipei Times. 2006-12-10. Retrieved 2009-08-10. ↑ "KMT wins two-thirds majority". Taipei Times. 2008-01-13. Retrieved 2009-08-10. ↑ "Rain dampens enthusiasm for protest". Taipei Times. 2006-09-11. Retrieved 2009-08-10. ↑ "Pro-localization groups stage rally on Ma's 100th day". Taipei Times. 2008-08-30. Retrieved 2009-08-10. ↑ "Clear Ketagalan ahead of Double Ten, Wang urges". Taipei Times. 2006-09-06. Retrieved 2009-08-10. ↑ "Taiwan Garbage Trucks: Classical Music Accompanies Collection (VIDEO)". Huffington Post. 2012-01-09. Retrieved 2018-06-08. ↑ "Recycling: Taiwan's Way of Life". Taiwan Review. 2010-03-01. Archived from the original on 2010-12-06. Retrieved 2010-08-31. ↑ "Administrative Districts". Taipei City Government. Retrieved 2010-07-11. 1 2 Jones, Ian (2008). City Museums and City Development. Rowman & Littlefield. p. 102. ISBN 0-7591-1180-4. ↑ "Only 13% using Taiwan's public transport". The China Post/Asia News Network. 2010-02-06. Retrieved 2010-02-08. 1 2 "Taipei City Today". Taipei City Government. 2004-08-17. Archived from the original on 4 November 2013. Retrieved 2009-08-11. ↑ "Metro Tickets". Taipei Rapid Transit Corporation. Archived from the original on 22 August 2008. Retrieved 2009-07-14. ↑ "Taipei Main Station Project". Railway Reconstruction Bureau, Ministry of Transportation and Communications. Retrieved 2011-02-23. ↑ "CHAPTER 13 Transportation and Telecommunications". Republic of China Yearbook 2008. ROC Government Information Office. Archived from the original on 2009-12-13. Retrieved 2009-07-14. ↑ "Traffic chaos expected in Xinyi". Taipei Times. 2010-05-24. Retrieved 2010-07-11. ↑ "National Taiwan University – About NTU". 2007-08-06. Retrieved 2009-07-27. ↑ "Little League Baseball". www.littleleague.org. Archived from the original on 17 October 2007. Retrieved 26 July 2017. 1 2 3 4 5 "Taipei City Council". Retrieved 2016-10-20. ↑ "International Cooperation: Sister Cities". Seoul Metropolitan Government. www.seoul.go.kr. Archived from the original on 10 December 2007. Retrieved 26 January 2008. ↑ "Seoul -Sister Cities [via WayBackMachine]". Seoul Metropolitan Government (archived 2012-04-25). Archived from the original on 2012-03-25. Retrieved 2013-08-23. ↑ "Sister Cities International (SCI)". Sister-cities.org. Archived from the original on 2015-06-13. Retrieved 2013-04-21. ↑ "Phoenix Sister Cities". Phoenix Sister Cities. Archived from the original on 2013-07-24. Retrieved 2013-08-06. ↑ "Miasta partnerskie Warszawy". um.warszawa.pl. Biuro Promocji Miasta. 2005-05-04. Archived from the original on 11 October 2007. Retrieved 2008-08-29. ↑ "Sister Cities". Dallas-ecodev.org. Archived from the original on 28 May 2010. Retrieved 23 May 2010. ↑ "Twin cities of Riga". Riga City Council. Retrieved 2009-07-27. ↑ "Partnerská města HMP" [Prague - Twin Cities HMP]. Portál "Zahraniční vztahy" [Portal "Foreign Affairs"] (in Czech). 2013-07-18. Archived from the original on 2013-06-25. Retrieved 2013-08-05. ↑ Mary Chin (5 May 2017). "City and cultural pacts with Taipei soon". Daily Express. Archived from the original on 5 May 2017. Retrieved 5 May 2017. Note: A: not the county seat. † Disputed. See: Positions on Jerusalem.